I started using a MacBook nearly 3 years ago and since then I’ve been hunting for a perfect desktop Gmail client. I’ve tried clients like Apple Mail and Thunderbird but somehow I kept going back to the now-defunct Google Inbox or Gmail on the web. But almost two months ago I found the perfect client to get my Gmail interface fix – Boxy. It’s developed by the same team which released a nifty little Inbox desktop app nearly four years ago. Now, if you take a look at Boxy for Gmail, you’ll think it’s just Google email service’s web interface ported in a Mac app. And you’re not entirely wrong. Boxy’s co-founder and designer Fabrizio Rinaldi tells me the team is using a custom Safari wrapper. “We opted for a Safari wrapper instead of Electron because the latter is still not optimized for macOS and we wanted full control on the apps, and most importantly keep them lightweight (1/10th of the size of the average Electron app),” he told TNW. Apart from all the niceties of Gmail, there are few more features to look forward to for Boxy users: Dark mode customized to Match MacOS’ dark theme, the minimal mode for a cleaner look, calendar integration with Boxy Calendar, and Reader mode for distraction-free reading. Additionally, it supports all Mac-based shortcuts and offers a status bar icon to quickly hide and show the client. If you don’t want to keep the email client open all the time, you can also use Boxy dashboard to keep an eye on your email and calendar notifications. Boxy for Gmail is a great email client for Mac if you’re looking for a no-frills app and satisfied with all the features Gmail offers. I’m one of those people for sure. 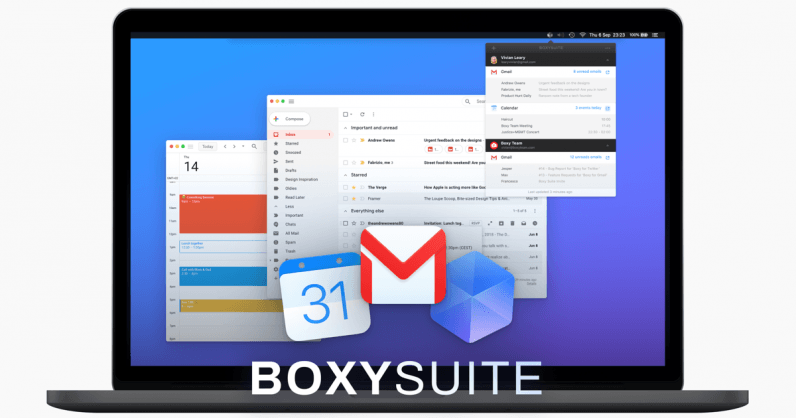 The Boxy suite is free to try out for seven days, post that, you can either pay $49.99 for a year or $149.49 for a lifetime license. At that price, it’s far more expensive than alternatives like Airmail and Kiwi, which offer similar features on macOS. You can try out the Boxy suite here.